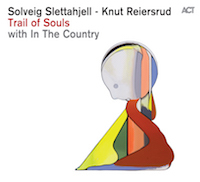 Today is Trail Of Souls released on the Norwegian market, our studio album with Solveig Slettahjell, Knut Reiersrud and In the Country. We´re extremely happy about it! We are playing concerts in Horten on November 25th and Oslo on November 27th. The German release takes place at the Norwegian Embassy in Berlin on November 26th! Today In the Country is recording its next album, together with the great guitarist Knut Reiersrud and the fabulous singer Solveig Slettahjell in Rainbow Studio in Oslo, Norway. The album will be released on ACT in the autumn of 2015. Stay tuned! In the Country is releasing a brand new EP with a brand new project with Thomas Dybdahl today on Petroleum Records. On March 7th we will perform one of the songs from the EP on the TV show Lindmo on NRK1. Monica Heldal will also be joinging us, as she also did on this particual song on the recording. Just came back from a great week long tour in Japan, with shows in Tokyo, Jouetsu and Yokohama.We were playing our music to the silent film version of Hamsun´s "The Growth of the Soil" from 1921. It was great fun and the film was fantiastic. Thank you for coming out to the shows! In the Country starts off the new year with a Norway tour with Frida Ånnevik for the latest album Skogenes sang, which just before Christmas received a Spellemann nomination. In the Country is returning to Germany and Switzerland on November 18th-29th! First up is Marburg, followed by Munich, Elmau, Geneve, Bern and Landsberg. On the 21st in Elmau we are accompanied by Solveig Slettahjell and Knut Reiersrud, in the spirit of the Berlin Philharmonic concert back in March 2015. Looking tremendously forward to this! Releasetour in Norway for Skogenes sang starts in Suldal on October 16th! Yeaah! The fresly pressed album Skogenes sang has arrived in storage. Bringing it out on October 17th! 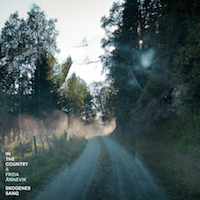 In just two weeks from now In the Country is releasing its next album, with the great Frida Ånnevik as a fourth member. The album "Skogenes sang" is music by Morten Qvenild and In the Country and lyrics of the forest poet Hans Børli, and its all being released on Grappa. In the Country had a fantastic week in Korea and Japan last week, playing for the first time in Korea at the beautiful BBC Hall in Seoul. A short trip to Tokyo was also possible, bringing Solveig Slettahjell with us as a special guest. Thanks for the great time and we look forward to be back! 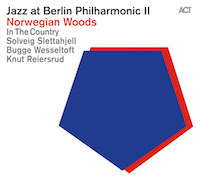 Today In the Country is relasing the beautiful Berlin Philharmonic procjekt Norwegian Woods on ACT, together with Solveig Slettahjell, Knut Reiersrud and Bugge Wesseltoft.The result is amazing, and you should all check out these great people who we have been fortunate to share this concert and live album with! In the Country is attending Jazzahead in Bremen this year! The trio is part of the ŠKODA clubnight program at Jazzahead, playing an hour show on Saturday, April 26th at 11pm @ Sendesaal, Bremen, Germany. Konnichiwa Japan! We´re back to do five shows this week! Concerts are spreading through Kyoto, Kobe and Tokyo. First out is RAG live spot in Kyoto tonight! For more shows, check out this! Great news - the Berlin Philaharmonic concert, with these fantastic people: Bugge Wesseltoft, Knut Reiersrud, Solveig Slettahjell and Mathias Eick, is also coming to Oslo! March 10th is a one time chance in Norway to hear this project before we all head down to Berlin and to the great Berlin Philharmonic Chamber Hall. Be sure not to miss this!! Ten years have past and we´re looking ahead toward the next ten years. We start off the concert season in March with concerts in Belgium and Germany before heading back to Japan. We´re particulary looking forward to play at the great Berlin Philaharmonic together with a great bunch of Norwegian friends. Bugge Wesseltoft, Knut Reiersrud, Solveig Slettahjell and Mathias Eick has been selected together with In the Country to do a concert by Siegfried Loch, founder of ACT Music. Looking tremendously forward to it! After five albums and concerts in 30 countries In The Country is celebrating ten years as a band! musikalske venner som STIAN CARSTENSEN, HILDE MARIE KJERSEM, FRODE GRYTTEN, TORA AUGESTAD, FRIDA ÅNNEVIK, CHRISTER KNUTSEN, IVAR GRYDELAND, PALEGOLAS, ANDREAS RIISER, CLAUS GULBRANDSEN & INGAR HUNSKAAR. In The Country touring in Deutschland und Österreich! Japan tour coming up, everybody! Just a couple of days away from our release concert at Cosmopolite in Oslo on March 1st. We´re playing the music from our latest record Sunset Sunrise, before we head off to Japan in two weeks. Hope to see you all around! Claus Arthur Breda-Gulbrandsen has even made a new video for us to show you during the concerts. We´re extremely excited! Now it´s out: In The Country - Sunset Sunrise. Juhuuu!! Today we finally got hold of the vinyl of Sunset Sunrise. We´re extremely happy with it! Happy New Year, everybody. We just picked up the new album at the post office, it looks fabelous! Looking forward to share it with you all in February! Just one week until In The Country returns to Taiwan, playing three concerts! Looking tremendously forward to be back!! We´re also visiting Singapore for the first time, doing two shows! See you all soon!! Tomorrow we head up to Umeå to play at their great festival! We have been looking forward to this since last year! We have sent our latest recording to Los Angeles to be mixed by the amazing Ryan Freeland! Can´t wait to hear the result! Summer is over and In The Country is back on the road in September, with concerts in Oslo, Kongsberg and Nesodden. Hope to see you there! Back from a fantastic tour through the U.S. Thanks for coming to our concerts and buying our music and videos! Great to see and meet you all, and we hope to be back in not too long! Soon off to the US again. We´re extremely happy to come back to the promised land to play concerts all over the States. Starting in Seattle on May 23rd, back to the lovely Portland, finally playing at the great Hideout in Chicago and first timers in Bloomington, Baltimore and New Oreleans! Looking very much forward to this! Part two of In The Country´s contribution to the series Conexions is a concert at Pizza Express Jazz CLub in Soho in London on April 14, also with steel guitar legend BJ Cole. London host is Nick Luscombe. Flomotion DJ sessions till late. An exciting concert coming up with In The Country, BJ Cole and Frida Ånnevik at Nasjonal jazzscene in Oslo on April 11. All new music and lyrics by Hans Børli. This concerts is part of BBC's Fiona Talkington´s series Conexions. Happy New year, folks! We´re up and running again, planning new concerts and tours around the world, and hopefully we´re coming to concert hall near you soon! First up is two concerts that are part of the concert series Conexions curated by BBC's Fiona Talkington in Oslo and London. On both concerts we have the great British pedal steel guitarist BJ Cole. We´re looking very much forward to this! Just a couple of weeks now before we go back to Finland for our second concert in Finland ever! We´re playing Tampere jazz Festival on November 5th. And just two weeks after Tampere we return to our favorite German and Swiss clubs to do concerts during the last week of November! We´re also adding A-Trane to our schedule, as our first concert in Berlin. Europe, here we come!! Back from Asia! We had an amazing time in China, Hong Kong, Taiwan and Mongolia during our almost three week Asian tour! Thank you all for coming to our concerts and buying CD´s and LP´s! Hope to see you next time! Latest update on our upcoming Asia tour: Mongolia and Giant Steppes of Jazz Festival in Ulan Bator has also been included in the tour. Really excited about that! In The Country is going back to Asia in September, after having a fantastic time in Malaysia in 2009. This time we´re playing concerts in Hong Kong, mainland China and Taiwan. More concerts in other countries will follow. To be updated soon. Looking forward to! We´re thrilled to give you a promo preview of our upcomming video dvd Sights, which is part of a live album release on Rune Grammofon in July. Enjoy! Like the bears we´re now coming out of winther hibernation these days. But unlike the bears we haven´t been sleeping all winther. We are soon finished producing our first live album these days, and we are releasing it in June, on our upcoming North-American tour. But we are not just making a CD from one of our concerts, we thought we just as well would make a full length concert video/artfilm/film noir out of the whole project. Our amazing assosiated video-genius Claus Arthur Breda-Gulbrandsen is working around the clock to put together the footage from three of our concerts plus additional footage outside the concert arena. We are totally excited about the product and we are really looking forward to release it to you guys! We´re extremely happy and proud to give you our first new music video of the song "Kungen" from our latest studio album "Whiteout". Please Enjoy! It´s been a while since we last updated our news feed, but we haven´t been lazy. During the year we´ve been touring through all of Norway, released or first concert mini DVD, with footage from the "Live in studio" concert at Etne in February 2010. We´ve also recorded four of the concerts on our tour in Norway in October, filming some of the concerts for a future live-DVD/artfilm/live-CD and filming our first music video. Thanks for coming to our concerts and for visiting our webpage, MySpace and Facebook page. 2011 is going to being an exciting year for us, with tours in new continents, releases of CD´s and DVD´s. Please follow our news feed for more updates on releases and concerts. Feb 11, 2010. The interview is in Norwegian. The Swedish jazz magazine Lira voted Whiteout as The best recording of 2009. John Kelman from All About jazz has included In The Country´s third album Whiteout on the list of Best releases of 2009. The Music blog and radioshow Undomondo from Istanbul, Turkey has included Whiteout on their Best of 2009 list. Chris Barton from Los Angeles Times has put Whiteout on his list of Top 10 Jazz CDs of 2009. Per A. Risnes Jr. from the Norwegian Dagens Næringsliv has put Whiteout on his list of Best albums in 2009. "Ut i naturen (beautiful Norwegian wildlife television program) on NRK. See our new YouTube video with a compilation of our latest album "Whiteout". Excerpts from In The Country´s third album "Whiteout" on Rune Grammofon, recorded in Atlantis Studio in Stockholm, Sweden, January 2009, with film footage from a live concert at Parkteatret in Oslo the 24th of Oct 2008. In The Country will appear on both North Sea Jazz Festival in Rotterdam July 11 and at Heineken Jazzaldia in San Sebastian July 23. In The Country´s third album "Whiteout", was released in Norway today. Buy it here or here. In The Country is proud to present the two songs from their new album "Whiteout", released in Norway on the 25th of May. To listen, go to ITCs MySpace-page. Hope you like it! Morten Qvenild is hosting the Sessions evenings at the National Jazzscene in Oslo in February. All new photo gallery layout! Check out here. Happy new year! We´re looking forward to an exciting new year, which includes recording and releasing of our third album on Rune Grammofon, tours and festival appearances. First up is Dublin, January 22, with a double bill with Susanna Wallumrød and In The Country. Morten Qvenilds newly written music (this years Kongsberg Jazz Festival price winner concert) is being recorded in January 2009, at the fantastic Atlantis studio, the old ABBA-studio, in Stockholm. This album will be released on Rune Grammofon medio 2009. Festivals and jazz club booking requests for Summer and Fall 2009 are most welcome. Next year´s booking has started and In The Country are available for touring jazz clubs week 16, 19, 20 and 22. Festivals and clubs on other dates might also be possible. The Dublin-concert, which were supposed to take place October 25, has been postponed to January 22, 2009. We´re really looking forward to come to Dublin next year. See you there! We´re happy to annonce an additional concert to our upcoming tour in October. The 24th at Parkteateret in Oslo we are inviting Susanna Wallumrød and vibrafonist and guitarist Andreas Mjøs to join us. Also video artist Andreas Riiser plays a major role in this grand encore from this years Kongsberg Jazz Festival price winner concert. Summer is soon over and concerts at festivals in Kongsberg (Norway) and Gaume (Belgium) was fantastic. Look out for selected concerts in October and November. Bass player Roger Arntzen has just received Oslo Bys Kulturstipend. The grant was awarded at Oslo city hall. Drummer Pål Hausken has been awarded a musicians award at Maijazz in Stavanger. In The Country has had a long Christmas vacation, but is now touring in Italy and is also appearing on festivals in Norway and Europe throughout the summer. Check out the new Gallery page. A lot of new pictures!!! Also new pictures and video in Country page. Morten Qvenild is awarded the DnBNOR Award/Kongsberg Jazz Festival Musicians Award 2007. More information here (in Norwegian). The schedule for In The Country´s US-tour is complete. Look for dates in the livedates section. In The Country is touring in England the upcoming week. The tour is a double bill with Hanne Hukkelberg. First up is Norwich followed by concerts at the Luminaire in London and concerts at Ray´s Jazz at Foyles and Spicejazz at Spice of Life. The tour is ends in Bath at Bath Jazz Festival. 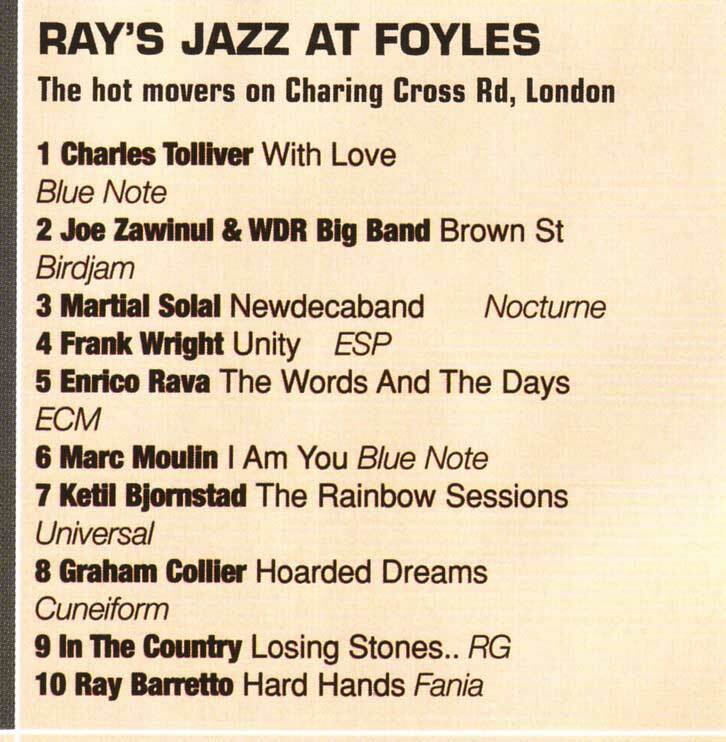 Losing Stones, Collecting Bones is climbing the list of hot movers on Sharing Cross Rd, London, according to Ray´s Jazz at Foyles. Our concert from the Empty Bottle in Chicago last spring is now put out for downloading on abstractscience.net. Animator Andreas Paleologos (Palegolas) is working with us on a project for Rikskonsertene on schools in the Oslo area. Palegolas is performing with live drawing and animation. We are thrilled to be working with him! is a freelance jazz critic, contributor to the New York Times. You can hear the radio show here and read the CD Review in The New York Times here. Today is the release concert in Oslo for the record "Losing Stones, Collecting Bones". Yeah! In The Country appeared at the radio show Harald Are Lund on P3, Nrk November 23. He is one of the coolest radio guys you´ll find in Norway! Hear the show here. We´ve just come home from a fantastic Rune Grammofon Tour togehter with Susanna and the magical orchestra and Supersilent...two fantastic band to tour with. Nine countries with amazing audience. Thank you! Our new album is released and out in the stores. In The Country is releasing their second album "Losing Stones, Collecting Bones" in the 6th of November. Music and coverart will soon be put on our website. Dates for the Rune Grammofon Tour 06 with Susanna and the Magical Orchestra + In The Country + Supersilent is announced in the livedates section. We are pleased to announce a new feature here at inthecountry.no. A hole new "nature" section is published under Country. Hope you like it! The new record is coming out soon. The final mastering and mixing is finished and we are very exited about the release in November. Be on the look out for any updates! In The Country has just recently been to Stockholm and recorded its second album. Janne and Lalla at Atlantis Studio were again fantastic and made us really enjoy our recording time in Sweden. Thank you! The record is being released by Rune Grammofon at London Jazz Festival 2006. Great feature interview in the May edition of Downbeat by Peter Margasak. Postizos, and downtown NYC icon Marc Ribot is playing with us at Tonic in New York the 9th of February. The first US-tour is coming up in February 2006, and In The Country will visit Chicago and New York. In New York we will play an extra concert at The Norwegian Seamen's Church on 52nd Street. Steel guitarist Bob Hoffnar from New York will join us on this concert. In The Country is presented in the article about the "Holy Trinity" - the pianio trio. Read the whole article here. In the August edition of Downbeat Magazine In The Country receives great acclaim for the CD "This Was The Pace Of My Heartbeat". Read the review here. Listen to music critic Jason Koransky from Downbeat magazine comment the CD "This Was The Pace Of My Heartbeat" with Bill Radke on Weekend America. In The Country and the great guitar player and teacher Jon Eberson is put together to teach young talents in Balestrand at the Balejazz Jazz Festival. Here you can see some photos from the release tour. Yesterday was the last day of ITC´s release tour for the CD "This Was The Pace Of My Heartbeat". We have been out for two weeks now and it´s been great. Thank you all for coming to our concerts, and for bying our CD and T-shirts. We hope to come back again some other time. Here are some lines about In The Country and Norwegian Jazz in Jazz Times. Today In The Country can be heard on "Midt i Musikken", a Norwegian radio program on the channel Nrk P2. The show starts at 15:03. Here are some photos from Vossajazz Jazz Festival the 19th of March. "This Was The Pace Of My Heartbeat" (RCD2045) was released today. Then you have to click on the date of the show: 03.03 (20:03-23:00). We are on at the end of the broadcast. Enjoy! Here are some pictures taken of In The Country at Rockefeller during Oslo Jazz Festival 2004 by Mizuho Yabe (jp). Se the them on www.grinningtroll.com. The date of the concert at BLÅ in Oslo is changed from the 4th of April to the 7th of April. In The Country is having a release tour in the periode the 5th April to the 16th of April, releasing the debut album This Was The Pace Of My Heartbeat on runegrammofon. The first concert of this tour is at Vossajazz the 19th of March. 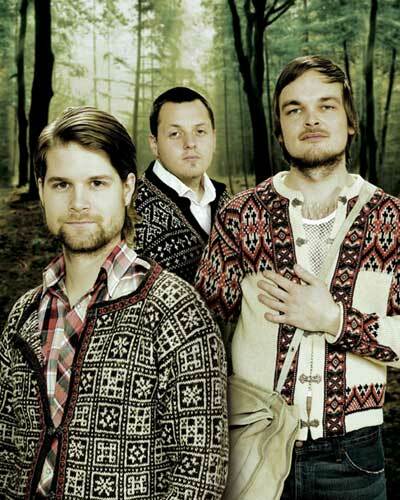 In The Country is going to by:Larm in Stavanger. Clarion is the scene where In The Country is performing on Saturday the 12th of February. You can also give your vote to ITC for "djuice audience award" here. All members of the trio is partisipating at the Jaga Jazzist 10 YEARS ANNIVERSARY at Blå in Oslo. Tonight Roger plays with Lars Horntveths & Pooka, and Pål plays with Tub Quartet. Morten Plays with Susanna & The Magical Orchestra and The National Bank on Saturday. The recording of the debut album for In The Country is finished, and the result was oustanding. We all look forward to release the CD, in March, next year. The recording week in Stockholm has started, and we start recording on Tuesday. Everything is rigged on Monday evening and the recording is finished within Wednesday evening. In The Country is going to Atlantis Studio in Stockholm, Sweden, between the 6th and 9th of December, to record the debut album. The record is being released by Rune Grammofon in 2005. NOW / contemporary jazz in norway by 10" - a DVD production developed as a collaboration project between the Lillehammer University College, DølaJazz/Lillehammer Jazz Festival , Film 3, Norwegian Jazz Forum, Norwegian Concert Institute and the Ministry of foreign affairs.